"Suggested For Mature Readers". They're not kidding with this one. 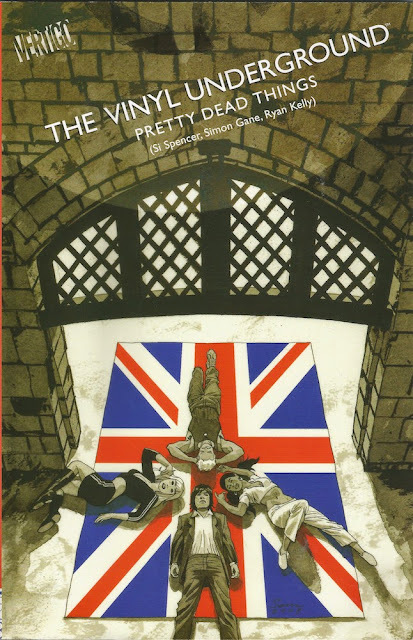 The Vinyl Underground ran for an all-too brief 12 book run in 2007-08 and combines the tarnished glamour of Britpop with the violence of the brutal Michael Caine movie Get Carter. Written by Si Spencer (whose writing credits also include TV soap EastEnders) it is a bleak mix of damaged antiheroes, occult crimes and weird sexual ritual. Had it been set anywhere else I fear I may have put it aside long before the end – it's wildly gory and gruesome. But what kept me going was the writer's palpable love-hate relationship with this city of ours and his knowledge of its history. 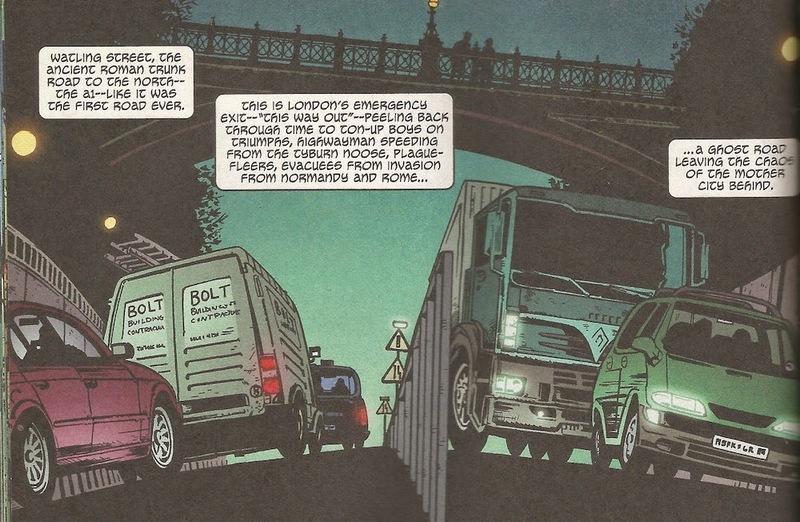 London is woven into the DNA of this comic. Not only is it shot-through with William Blake references, it also teems with Big Smoke lore. From the death of "God's Banker" Roberto Calvi, found swinging from Blackfrairs Bridge wearing "the Devil's Neckinger" back in '82, to Roman roads to World War II, those in thrall to the psychogeography of London will not be disappointed. The locations really get down to the London nitty gritty, too. Artists Simon Gane, Ryan Kelly and Cameron Stewart take Spencer's story well off the beaten track – I blogged earlier about The Wicked + The Divine which goes into similarly obscure corners of London. In The Vinyl Underground we stop by Bunhill Fields, Canonbury, the New River, Islington and Paddington Green, among others. When we do swing by the big ticket items – "main site London" as the P.R types call it – we are treated to an imaginative use of the familiar sights. Take the cover above, for example: Britpop-meets-Traitors' Gate. …often referred to by its chilling nickname Suicide Bridge. The frame above really captures both the precipitous bridge and the thundering river of traffic in the man-made chasm beneath. Designed by Sir Alexander Binnie, and also referred to as Archway Bridge (it spans the Archway Road) it is a cast-iron replacement for an earlier brick bridge designed by John Nash. 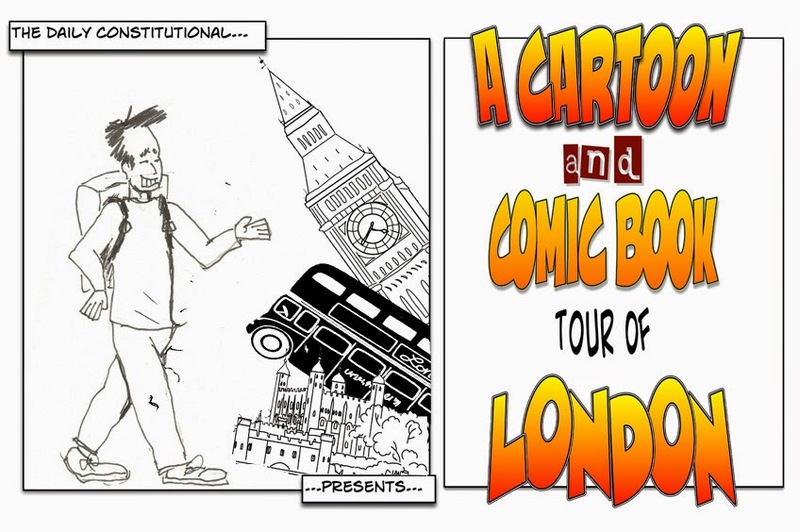 The Cartoon & Comic Book Tour of London will return soon.